64 families make up the indigenous peasant commune Chica Tola Tumbaco parish, located 24 km north-east of Quito. We settled in the Hill ancestrally Ilaló. Our legal status is December 29, 1944, through Resolution # 442 issued by the Ministry of Agriculture. Our Community territory is a total of 105 hectares, and extends into Gaza from the foothills, adjacent to the neighborhood Plazapamba, to its highest peak, ranging from 2480 to 3200 msnm From here you have a panoramic view of the valleys and Chillos Tumbaco, in the east, the eastern fringe of the Andes, highlighting the snowy Antizana, Cayambe and Cotopaxi south, and the west side can distinguish the capital city, Quito. Originally we had 180ha. community land, but urban pressure, the result of the rapid expansion and disorderly Quito, many communes near the city were disappearing as a result of the land market and / or invasions. In the latter suffered in the late 80s of last century, but after ten years of struggle we reclaim our common property, but lost 75ha. So now our main objective is the defense of our Community. Unfortunately the threat to the communities persists, so our original community center (community hall, classroom workshop and collective space) was invaded and destroyed in 2003. Since then, and our struggle to defend our property, we have fully recognized the justice of our rights, but the problem persists, we will not rest until the problem is in general benefit. 1. Crop planting shekel short or long, depending on the ecological level, mainly maize, potatoes, peas, beans, beans, legumes and vegetables. 2. Organizational Strengthening: empowerment of communal forms of organization and government. 3. 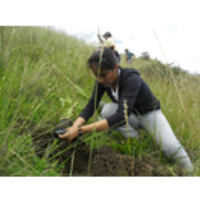 Ecology and environment: work for the recovery of biodiversity Ilaló the hill, a process more than 10 years and involving the extension of remnant native forest and reforestation, and environmental education. 5. Community Education: 2 years we are implementing SAMAY Community School, a proposal that seeks through a holistic and intercultural education and raise community experience.